I'm a creative person both at work and at home, and my mind never rests. I write because I love to entertain people. There's enough depressing news in real life. I write to carry you away, and to entertain my audience. I had the idea for this book one Saturday morning in a busy shopping mall when my wife commented on how much the fancy Jag parked next to us was worth. I said that the value of all the cars in the mall's parking lot must be worth more than the mall itself. And then I had an evil idea, and so Garage Band was born. Ever met a creative genius? Read Garage Band and you'll meet two of them. The first is the author, Adam Rabinowitz; the second is his protagonist, Lanthus Trilby. And Lanthus is surrounded by a supporting cast of colourful characters, each of whom is a genius in his or her own field, whether it is hacking into complex security systems, or swinging from building to building as easily as Tarzan does from trees. This Garage Band does not create music. It creates mayhem for a massive corporation, security companies, police and computer experts. 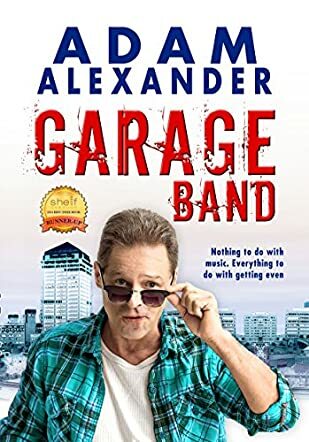 This Garage Band is a group of highly talented and skilled individuals brought together by Lanthus Trilby when he is suddenly let go after years of service as an actuary for an insurance company. Tired of being dismissed by his boss and co-workers, along with his wife and children, as being competent but dull, "beige" as it were, Lanthus launches a scheme that proves how very much everyone has underestimated his genius. His plans to financially bring down his former employers by threatening to destroy an entire shopping center parking lot full of expensive cars are pure genius. Lanthus Trilby's plot is so convoluted that one readily grasps the concept that genius is very close to insanity. And as all hell breaks loose everywhere, readers are simultaneously holding their breaths and smiling as they turn the pages of a book written by a creative genius, Adam Rabinowitz. Garage Band is an impressive bit of writing, near impossible to fault. Characters are realistic; dialogue flows naturally; the plot is complicated but logical, and the conclusion is utterly satisfying. Those who will enjoy this book are intelligent, clued into the ramifications, both good and bad, of modern technology, and love a well-thought out and executed plot. But these readers will also have a soft side that understands how losing a job after years of loyal service can unravel an employee. They will identify with family members losing touch with each other to the point that they don't even know each other. In its own way, Garage Band is about music, the music of life, where harmony isn't possible unless all the players are in sync and in tune with each other. Lanthus Trilby makes sure his garage band knows their parts perfectly till the very last note is played. And Adam Rabinowitz deserves the applause readers will give Garage Band.